Dottie was given the green ribbon when she was born. It represented the green gem stone called the peridot. We gave her that ribbon because she had the most white on her and the most dots. Lisa J with whom we co-own this little girl, decided to keep the call name for her because it fit! Above you can see her at seven weeks. Her registered name comes from a wild flower called the Indian paintbrush and the prairie fire was another name for this bright red plant – perfect for a little red and white Welshie girl. Our daughter Amy, Ken who owns Ruby ll, and Lisa all attended a few conformation classes to learn about handling skills in the ring and all have done very well. Most of the Welsh Springer Spaniels being shown in the breed rings today are owner-handled. What a great group of people Welshie owners are and what fun it is to get together! We are proud of all of our owners and their dogs. 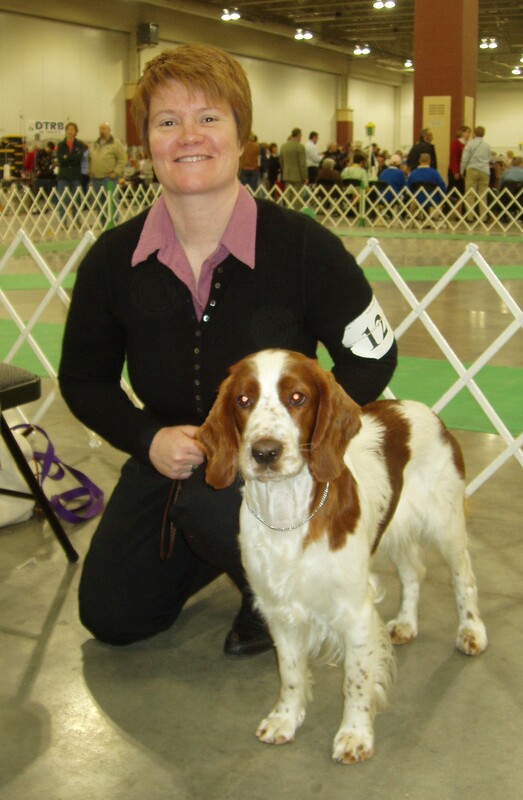 Dottie finished her breed championship at Cyclone Country Kennel Club in Des Moines, Iowa February 2011. Dottie had her first litter two years ago. She had five beautiful puppies out of Billy – CH Islanza Gee Whizz. One of those puppies, Dilly, is now being specialed in the breed ring.